Traders and shop owners at Orie Amaraku Market, in Isiala Mbano Local Government Area (LGA) of Imo State are still counting their losses months after their community market was demolished on the orders of the Rochas Okorocha-led Imo State Government. As with the majority of the demolitions carried out across the state, government forces pulled down Orie Amaraku Market without giving local traders and shop owners adequate notice, compensation or an alternative trading space. Community efforts to get justice have been marred by lack of access to legal resources and representation. Many are not aware of the formal and informal mechanisms for seeking legal redress for the losses they incurred nor do they know how to organize to challenge the the associated human rights violations they have experienced. Spaces for Change.S4C‘s March 27, 2018 one-day community workshop in Amaraku, Mbano, Imo State formed part of the organization’s broader strategy to fill the knowledge gap and provide resources needed to address the community’s unmet legal needs. 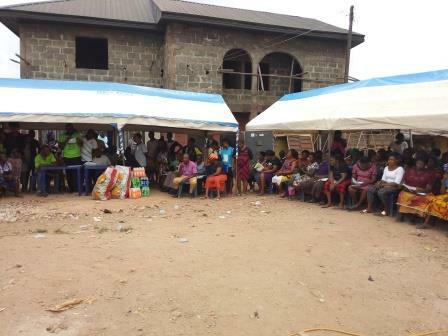 Over 80 participants comprising mainly of the affected traders, market women, artisans, okada riders and farmers engaged in different kinds of businesses in the demolished market. The majority of them now sell or hawk their wares in makeshift tents erected in and around the demolished market. The morning session of the workshop afforded participants an opportunity to share experiences regarding how they have been coping since the demolitions in September 2017. One participant narrated what happened on the demolition day. She talked about how state authorities invaded the market without a notice served on her and other traders. Shortly before the demolition day, state officials came around and informed traders that a more befitting trading complex will soon be erected in the market. The officials neither disclosed when the new building will be erected nor when the demolition of the existing market will take place to enable traders made adequate relocation plans. To their chagrin, officials stormed the market one morning with bulldozers and began the demolition exercise. As a result, traders suffered immeasurable losses. When SPACES FOR CHANGE asked whether the state government compensated the affected traders, the crowd chorused a loud NOOOOOOO! ‘Nobody, male or female, received any form of compensation from Imo State Government before or after the demolition of Orie-Amaraku Market,’ one market women lamented amid sobs. Another participant, who doubles as the Chairman of the Orie-Amaraku Traders, added that he lost his shop during the demolition exercise. Ever since, life has been very difficult. He sells drugs and most of his goods are now prone to damage because they are not being properly stored in a shop and displayed on open shelves. Preserving those drugs during the raining season presents a harder challenge. One major consequence is low sales and patronage, making it difficult for him to sustain himself and his family. Both speakers appealed to SPACES FOR CHANGE to reach out to Imo State Government on their behalf. They want to see the market reconstructed as promised. They want the state government to accelerate the market reconstruction efforts so that traders can be resettled in the new structures. After the workshop, participants shared that they have never heard about housing rights. They did not even know that such rights existed. The workshop enabled SPACES FOR CHANGE to close this information gap. SPACES FOR CHANGE clarified the legal provisions in the Nigerian Constitution and the Land Use Act that protects the property rights of citizens. For instance, although the Land Use Act of 1978 gives the Governor of the State the right to revoke the proprietary rights of any land in the State, the same law (the section 43 & 44 of 1999 CFRN as amended) grants every citizen of Nigeria the right to own immovable property. The governor cannot revoke such rights and interests in property without the prompt payment of compensation. The workshop successfully overturned certain myths widely held by many participants. One such myth is that ‘nobody can fight government’. This myth is a widely-held notion in the community, instilling fear in many and preventing them from taking action against the injustices they have faced. By the end of the workshop, participants learned that they have the legal right to sue, to seek redress in court and demand compensation from the government. The courts are obligated to determine their interests in their property and the amount of compensation due to them. Thus, the popular opinion that ‘‘government cannot be sued by a private citizen’’ is beginning to wear out. They also learned that their housing rights encompasses legal protection against forced evictions and arbitrary destruction of their shops, markets and private homes. 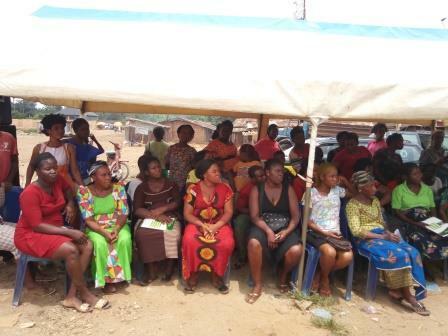 Through this workshop and a wide range of advocacy interventions, SPACES FOR CHANGE is continuing to provide legal advisory support and representation to rural and urban communities affected by Imo State’s urban renewal program in order to improve awareness of human rights and access to justice. PreviousPrevious post:Mbaise Women Organize for Community DevelopmentNextNext post:PRESS STATEMENT: GLOBACOM SACKS MARRIED WOMEN: IS MARRIAGE A DISADVANTAGE TO WOMEN IN CORPORATE NIGERIA?